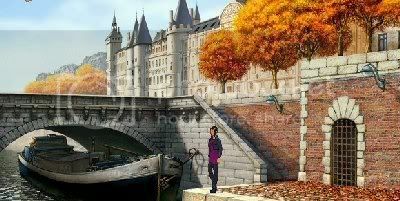 by PaulEMoz in "Broken Sword", "George Stobbart", "Nico Collard", "Shadow of the Templars", "adventure", "iPhone", "iPod Touch", "point and click"
I'm sure most of you have heard of the Broken Sword series of games. I bought this one, Shadow of the Templars, when it was first released on the PC. And I really enjoyed it. 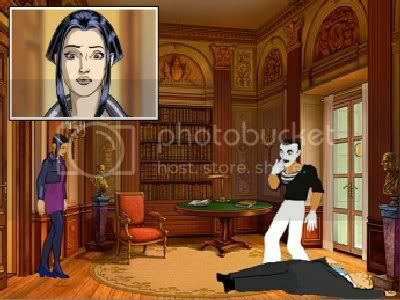 It was possibly the first point-and-click adventure I'd really bothered with. The lovely graphics, languid gameplay and (usually) not too obnoxious puzzles made it very appealing. So, all these years later, is a Director's Cut a good idea? Is it possible to add anything to the original that will enhance it? Or is this just an easy way to cash-grab with an existing title? Dammit, nobody likes mimes. There's a special level of hell reserved for mimes that murder. The good news is that Broken Sword: Shadow of the Templars - The Director's Cut is, as well as being quite a mouthful, really, really good. The main thing that comes as a relief is that they haven't broken anything with the game. There's nothing worse than playing a new version of an old game and finding it's been crippled by some daft revolutionary control method or something. Broken Sword's control method, on the iPod/iPhone, is fantastic. You'll slide your finger around the screen, and anything of interest will flash with a blue circle. Hold your finger over that, and a range of action icons will appear above it. Choose the one you want, and the game will respond accordingly. It's brilliantly simple and intuitive, and makes this portable version of Broken Sword a joy to play. Don't do it, Nico! Don't jump! What's that? You weren't going to? Oh. Well, until you get stuck, of course. Yeah, I'm still rubbish at solving the puzzles, and it's been so long that I've forgotten most of them. Plus, of course, there's a range of new puzzles. With this being a Director's Cut, you get more game, mostly seeming to involve George's French female friend, Nico, and her investigation into her father's death. The game has also had something of a graphical facelift, or reworking. The original's graphics were nice, and I can see that people would be quite happy to keep them, but this version looks lovely on your handheld device. For just £3.99, Broken Sword: Shadow of the Templars - The Director's Cut is one of my favourite iPhone/iPod Touch games so far. It's a big download - over 380MB. There's a lot of spoken dialogue which would account for a fair bit of that, and it's such a polished and enjoyable production that if you enjoyed the original or have never played it but like this kind of game, you'd be daft to ignore it. I look forward to the inevitable release of the sequel... and might it be too much to ask that we could see Blade Runner on the iPhone and Touch?